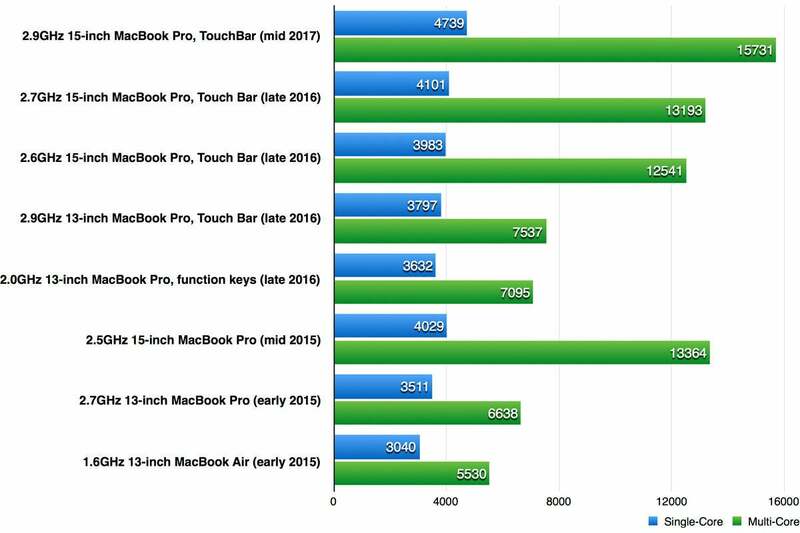 Apple’s newest laptop offers a speed boost over its predecessor, and we might even see bigger gains once macOS High Sierra is released. Apple's latest MacBook Pro gets a performance boost with Intel's 7th generation Kaby Lake processor. Did you hear cries of regret and maybe a few cuss words in the background during Apple’s Worldwide Developers Conference keynote? If you did, it was from folks who bought a MacBook Pro in the past few weeks. You see, during WWDC, Apple revealed an upgrade to the MacBook Pro to replace the models that were released just last Fall. Now, on the surface, the new MacBook Pro looks exactly the same, but all of the changes are found under-the-hood via performance bumps. And our test results do show an expected increase in speed, but it's not enough to induce serious buyer's remorse in anyone who recently bought a MacBook Pro of the previous generation—though it may spark a bit of envy. The heart of the MacBook Pro is where you’ll find the major change. All MacBook Pro models now feature Intel’s Kaby Lake processors, which replace the Skylake processors found in the previous MacBook Pro. For this review, a Kaby Lake 2.9GHz quad-core Core i7 in the model I reviewed replaces a Skylake 2.7GHz quad-core Core i7. 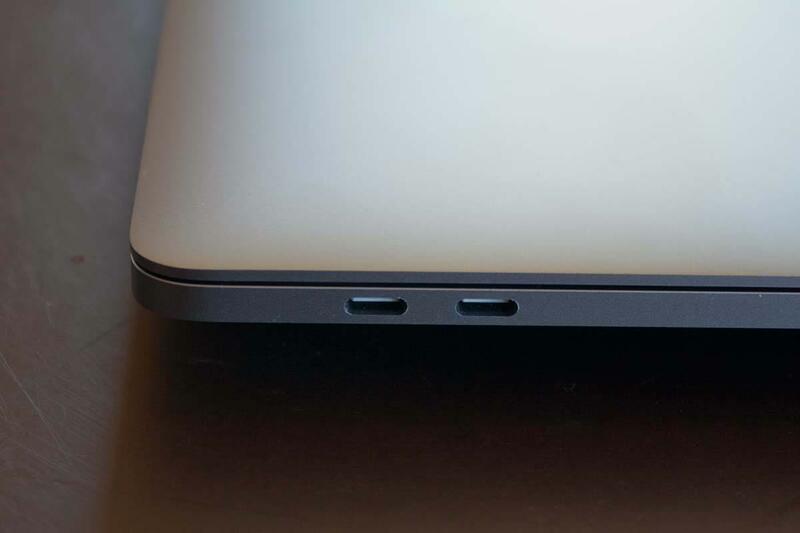 Stock up on adapters: The MacBook Pro relies on Thunderbolt 3 for connectivity. The 15-inch models have four of them. Our MacBook Pro Thunderbolt 3 adapter guide will help you get the ones you need. Another major change is the graphics technology. The $2,799 model now has the Intel HD Graphics 630 instead of the Intel HD Graphics 530 as integrated graphics. The discrete high-performance graphics chip is now a 4GB Radeon Pro 560, which replaces a 4GB Radeon Pro 460. Just about everything else about the MacBook Pro is the same as before. The aluminum unibody case design (available in Space Gray or Silver), the 15.4-inch display with a 2880-by-1800 native resolution and P3 color gamut, the Thunderbolt 3 ports (four ports on my review model), and the Force Touch trackpad are unchanged. The keyboard doesn’t have enough “life” for my taste, but I love the maxi-sized Force Touch trackpad. The $2,799 MacBook Pro comes with a 512GB solid-state drive. Apple says that the performance of the SSD is 50 percent faster than the previous SSD. The speed increase comes from improvements in the SSD’s hardware controller. 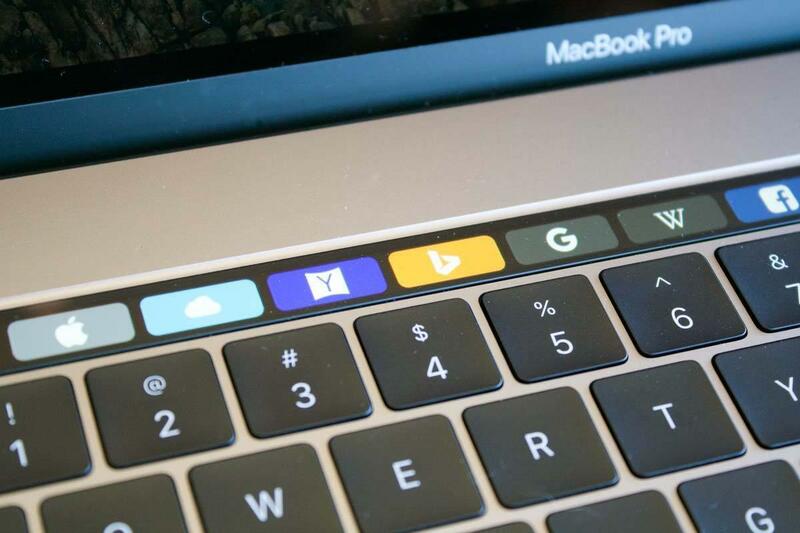 Introduced last year, the Touch Bar is here to stay. My personal experience with the Touch Bar? I don’t use it that much. I like using Touch ID to unlock the laptop, but I’ve gone through work sessions where Touch ID is the only time I use the Touch Bar. When I use a Mac, my focus is on the screen, and I just haven’t gotten used to looking down at the keyboard to use the Touch Bar controls. But I do know people who love the Touch Bar. I hesitate to say that the Touch Bar is wasted on me; if I forced myself to look at it, I’m sure I’d find it more useful. When it comes to the Touch Bar, as the saying goes, your mileage may vary. To gauge the speed of the new 2.9GHz 15-inch MacBook Pro, we ran a set of benchmarks tests. Our result show a significant boost over its predecessor. 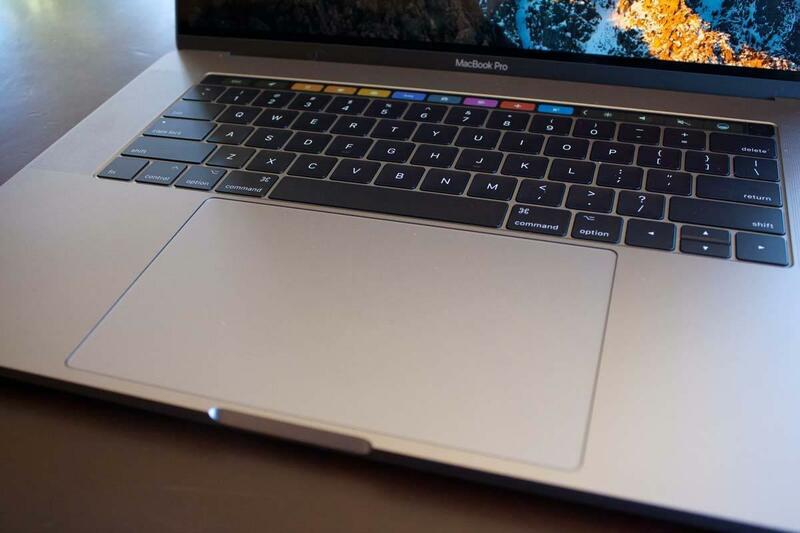 The 2.9GHz MacBook Pro we tested had a stock configuration: 16GB of 2133MHz LPDDR3 memory, a 512GB SSD, integrated Intel HD Graphics 630, and discrete Radeon Pro 560 with 4GB of GDDR5 memory. Longer bars are better. Click to enlarge. In Geekbench 4.1, the 2.9GHz MacBook Pro posted a score of 4739 in the single-core 64-bit CPU test, which is 16 percent faster than the 4101 score by the 2016 2.7GHz 15-inch MacBook Pro, the model that the new MacBook Pro replaces. In Geekbench’s multi-core 64-bit CPU test, the 2.9GHz MacBook Pro also saw a speed gain. Its score of 15731 is 19 percent faster than the 13193 score by its predecessor. We also ran a pair of graphics benchmarks to test the speed of the discrete graphics card. In the Geekbench 4 OpenCL test, the 4GB Radeon Pro 560 in the new 2.9GHz MacBook Pro posted a score similar to the 2GB Radeon Pro 450 in the 2016 2.6GHz 15-inch MacBook Pro. Scores are frames per second. Longer bars are better. Click to enlarge. The graphics performance difference is more apparent in the Cinebench OpenGL test. The 2.9GHz MacBook Pro scored 87.1 frames per second, a 14 percent boost over the 2.6GHz 15-inch MacBook Pro from last year. In our review of the MacBook Pro last year, we said that the MacBook Pro, even with 16GB of memory, is probably fast enough for most video editors. But even if you’re still not convinced, there’s another factor you should consider: macOS High Sierra. During the WWDC 2017 keynote, Apple announced that macOS High Sierra and its suite of Pro Tools apps will have HEVC support. This is definitely something to keep an eye on. We’ll be following the development of macOS High Sierra closely, and we’ll be ready with the video benchmarks once the HEVC support is ready to be put to the test. So, you’re in the market for a top-of-the-line laptop. Should you buy the $2,799, 2.9GHz 15-inch MacBook Pro? If you’re a general user who uses the internet constantly, uses Apple apps like Photos, iMovie, iTunes, Pages, and the like, you’ll find that the 2.9GHz MacBook Pro is certainly a luxurious laptop to have. You can probably save a few dollars and get the other 15-inch MacBook Pro configuration for $2,399. But if you insist on the best, you’ll be very happy. If you’re a pro user, you can’t be blamed for being disappointed in the 16GB memory limitation. But the upcoming 10-bit 4K HVEC support in macOS High Sierra and the potential for hardware acceleration using Kaby Lake’s built-in HVEC support makes for a very enticing combination. The 2.9GHz 15-inch MacBook Pro becomes a very attractive investment, even if you recently bought a previous-generation MacBook Pro. The MacBook Pro is ready to take on the tasks of the most demanding users. The Kaby Lake processors provide a nice boost over its predecessors, and its support for 4K HEVC video means it's ready for macOS High Sierra.